The RJ Knapp & Honey Robin band will be featured at the 19th Annual Mt Baker Rhythm & Blues Festival, (nominated best blues festival in the country), Sunday, August 3, 2014, from 11:00 - 12:30. Get your festival tickets now! Our new Retro-Rocking Christmas song!! Written by RJ Knapp, performed by RJ Knapp & Honey Robin. Guaranteed to make you smile - and hope you've been good little girls and boys Ho Ho Ho! 4 nominations from the Washington Blues Society 2013 BB (Best of the Blues) Award, for the RJ Knapp & Honey Robin band and it's members! Washington Blues Recording(for our CD Don't Blame The DYNAMITE...If you can't light the fuse!). Honey Robin on the air! You might gather from the title of RJ Knapp & Honey Robin’s new album that subtlety is of secondary concern here. Chicago-born but a mainstay of the Seattle scene since 1972, guitarist-lead vocalist Knapp has assembled a quartet that plays blues—or “bluz” as it’s spelled in the titles of four of the original tunes here—hard, stomping and merciless, kind of a cross between the Windy City’s bruising urban blues and ZZ Top’s southwestern sizzle. In addition to playing fierce lead guitar, RJ also handles lead vocals on most of the tracks; suffice it to say he’s not trying to impress you with the versatility or beauty of his singing voice. His is a deep, dark growl of a voice, not pretty but an instrument demanding attention be paid (you’ll hear echoes of the great southern sage Darryl Rhoades, of Hahavishnu Orchestra fame, in RJ’s swagger, and some of young Hank Jr.’s bravado). But RJ’s sure enough got the blues, or bluz, in a bad way. He comes thundering out of the gate with “I Call It the Bluz,” a simple explanation his scorched earth policy when it comes to his preferred musical style, complete with a wailing, upper neck Strat solo of the type he promises in the song. In the stomping “If the Bluz Was Money,” he imagines the luxuries that would be his if he could translate his woes (some of which stem from unemployment) into cold, hard cash (“if them blues was bullion/I’d be livin’ in Fort Knox/I’d be layin’ on them gold bars/not just this pile of rocks”), with a southern-style responsive chorus seconding his testifying. In one of the album’s more somber moments, the easygoing shuffle titled “Bus Stop Bluz,” RJ bemoans his proclivity for always “standing where I shouldn’t have been/in the wrong place at the right time” and missing out on something good, as Rick J. “Dr. Demo” Bowen supports his vocal and spare guitar with laid-back brush drums. Of course, what’s the bluz without some mean women to take to task? So it is that “Don’t Walk on Me” is RJ’s time to lash out furiously at a deceitful, lying distaff partner, as his guitar slashes and moans and the drums thunder. The band’s other voice belongs to “Honey Robin” Mahaffey (“The Canary”), who brings a strong, assertive presence to her spotlight moments. Her moody “Ready for Times” is the dark, languorous confession of a woman who has had quite enough, thank you, of bad luck in her life and looks towards a brighter future, however bone-deep hear weariness sounds. Her other big moment is on “Hole in My Heart,” a thick, roiling blues with a spacey feel, not unlike some early Big Brother blues ballads, with Honey Robin assaying the emotional devastation of a failed romance (“it hurts so bad every day and night/everyone tells me it’ll be alright/but they don’t live with all this heartache and pain/knowing you’ll never hold me again”). Like RJ, Honey Robin’s technical gifts are not overwhelming, but her presence as a vocalist brings an urgency to her performances that more paint-by-numbers singers cannot approach. RJ Knapp & Honey Robin, Don’t Blame the DYNAMITE, Critical Sun Recordings. 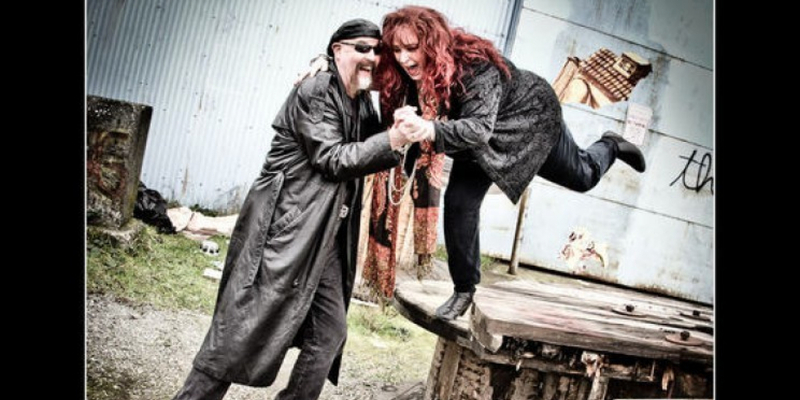 "RJ Knapp and Honey Robin understand what it is to engage and entertain an audience from beginning to end.Not only have I seen them start their show by entering a Festival on their Harley's, but they tend to open every show with a unique entrance. Their ability to follow up with a great show is what separates them from most. They are a class act, a very entertaining show full of original music and fun and they are a must see show"
"Here is the Blues Therapy Radio Top Ten list for the Month of March 2013 as submitted to Living Blues for National charting. Congratulations to all the bands involved-Great music!! 10. Habib Koite & Eric Bibb…Brothers in Bamako…Stony Plain"
BLUES UNDERGROUND NETWORK PODCAST AND CD PICK OF THE WEEK THROUGH NOVEMBER 24TH; Blues Underground Network's CD Pick Of The Week November 18-24, 2012 John Vermilyea RJ Knapp & Honey Robin's new CD, Don't Blame The DYNAMITE...If you can't light the fuse!, made the Blues Underground Network's top 10 CD's for the year 2012, and for December's top picks. RJ KNAPP & HONEY ROBIN/Don't Blame the Dynamite if You Can't Light the Fuse: Don't tell this old white guy in Seattle he don't have the blues. He'll round up a bunch of his biker buddies and show you who has the blues. A power blues show band relying heavily on originals, this bunch is a gasser that really know how to being the electric, amped up bluz (their word). No fair, Knapp probably bugged my phone and knew in advance I'd be partial to a record with a song called "Son of a Mother F... B...(sorry had to edit that part, and SOMFB doesn't quite stand for that...Honey Robin edit)". This bunch will get your blood flowing and keep you up all night. Once again we find the future of the blues is in good hands. Hot stuff. RJ “Blues Master” Knapp I first discovered bluesman RJ "Blues Master" Knapp when his 21st Century Bluzmen competed in the fourth semifinals of the Washington Blues Society’s International Blues Competition at the Oxford Saloon in Snohomish, Washington in 2011. I was impressed by the way he powered through an original set that tilted heavily toward blues rock, and I could tell that his influences ranged from Led Zepplin and Black Sabbath to Popa Chubby. RJ’s set featured high energy, plugged-in, and wonderfully over-the-top guitar histrionics thanks to the Blues Master. If you enjoy full-throttle blues powered by solid electric guitar, you’ll enjoy Don’t Blame the Dynamite… If You Can’t Light the Fuse. The straight-ahead country blues on “If the Bluz Was Money” relies on the spot-on rock steady beat from the considerably talented engine room of Rick “Dr. Demo” Bowen and “Rob “Powder Monkey” Baker on bass, punctuated by the Blues Master’s fluid slide work. “Hole in My Heart” gives RJ a chance to stretch with some opening, low-key licks that frame Honey Robin’s sultry vocals, and his inspired noodling up and down the fretboard shows that, as a guitar player, he’s much more than a three-chord power player. RJ’s been around the Seattle blues scene since the early 80’s, and he’s earned the nickname “Mr. Bluz” by paying his dues in Pioneer Square clubs. RJ’s inventive songwriting and innovative guitar playing are front and center on this CD. Since that International Blues Competition at the now-closed Oxford Saloon in downtown Snohomish, RJ and his band have played at the Big Sky Blues Festival in Noxon, Montana, and returned to the Blues to Benefit the Brave benefit held in Snohomish County in 2011 and 2012. I hope that this CD will get RJ, Honey Robin, Rick, and Rob more attention and more gigs throughout the Pacific Northwest. Their CD release party was held on December 7th at Cyndy’s Broiler in Stanwood, Washington, and I hope that we can feature the magic of that night in a future Washington Blues Society Bluesletter. Listen to clips from the CD below. After you check out the 15 (yes, 15!) cuts on the CD, please tell your favorite blues club that this Bothell, Washington-based blues outfit can really put on a show! RJ Knapp & Honey Robin – Don’t Blame The Dynamite, If You Can’t Light The Fuse! RJ Knapp was born in Chicago but has been on the Seattle scene for 30 years. This CD is almost entirely original material written by RJ with occasional assistance from Honey Robin Mahaffey (‘The Canary’) who sings backing and some lead vocals. RJ (‘Blast Master’) handles most of the lead vocals and the guitar. The rhythm section also sport nicknames and provide b/v: Rob Baker (‘Powder Monkey’) is on bass and Rick J Bowen (‘Dr. Demo’) plays drums. Lead-off track “I Call It The Bluz” is blues-rock with some powerful chords heralding the lyrics which demonstrate some touches of humour: “Don’t call me no rock and roller, I ain’t some funky white boy. Call it what you want to; me, I call it the blues”. Similarly “Don’t Let Your Mind Be Writing Checks” has the line “…that your mind can’t cash” after the title. Indeed, RJ demonstrates an ability to turn an amusing line on several of the songs here and “If The Blues Was Money” has some excellent opening slide work. However, RJ’s deep, gruff voice (think Omar And The Howlers) does not always make for easy listening. Robin takes over the lead on just two songs, both quieter ballads. Her clear and deep voice sounds as if she was trained in the classical traditions and offers a contrast to RJ’s. “Bus Stop Bluz” was a frustrating listen as RJ’s lyrics produce some very forced lines, allied to some irritating sound effects (boats, seagulls, planes, buses, etc). “Kirkland Krawl” is about a traffic black spot with a very repetitive riff and chorus; unfortunately the band decided that perhaps the title would not be meaningful to all, so a bonus track appears under the title “Concrete Crawl (for those outside the great NW)”! RJ produces some strong guitar riffs across these 15 tracks, there are some nice touches of humor in the lyrics and it is always good to see bands producing original material. Some great titles here, but gotta go with Mr. McClain’s. Radio Interview onThe Blues Note, KSVR.org Interview 12/5/12: Tune in to The Blues Note with Janice tonight at 10pm (PST) on KSVR 91.7fm / KSVU 90.1 fm or go to KSVR.org and listen in via the live stream. Radio Interview, Friday, January 11, 2013,with Host -Robin K, at KSER, 90.7, on Audio Indigo. Album: Don’t Blame the DYNAMITE…If you can’t light the fuse! PACIFIC COAST time of 6:00pm, or 9:00pm EAST COAST time. Subject: 2013 Wallace Blues Fest. 18th annual blues awards in Spokane on 11/8/12 everybody loved it. I checked out your music and enjoyed it very much. With your permission, I would like to include "I Call It The Bluz" on the 12/8/12 episode of "Music You Don't Have, But Should." The show will be Saturday, 12/8, at 8:00 PM EST, at www.musicyoudonthave.com, iTunes, Stitcher, Podbean, and LearnOutLoud.com. "Radio Interview with Pooner Clark on Locals Only, March 31, 2013 on KISM 92.9 FM, Clasic Rock"
Reviewer John Mitchell is a blues enthusiast based in the UK. 12,208 views since Wednesday, 04 May 2011.